Best Small Library in America! We are excited to share the news that one of our local libraries and the second place winner of the 2014 Growing Spaces Grant Program, has been named the Best Small Library in America by the Library Journal. This is an amazing accomplishment AND we agree completely! 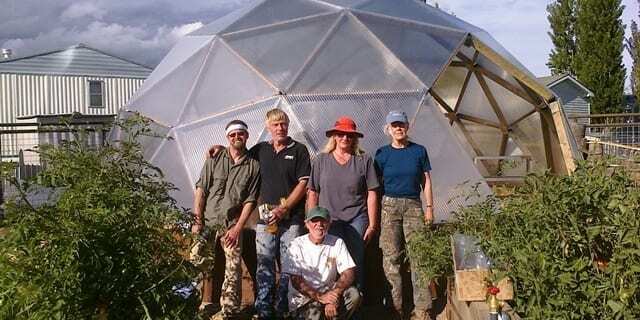 The residents of nearby Bayfield, CO are absolutely lucky to have such a wonderful program that includes at 22′ Growing Dome greenhouse, lending toolshed, and outdoor community garden. Pine River Library shared their press release with us about the award and the library, and we’d like to share the news with you so you have a chance to learn more about this awesome library. New York, NY, January 29, 2014— Pine River Library(PRL), in Bayfield, CO, has been named the 2014 Best Small Library in America by Library Journal. This annual award, cosponsored by the Bill & Melinda Gates Foundation, was created in 2005 to showcase the exemplary work of public libraries serving populations under 25,000. PRL, which serves a population of 8,749, was chosen for its leadership-minded staff; community support; strong partnerships; and the many initiatives that serve the varying needs of its patrons. The library’s motto, “connecting people to possibilities” is reflected in the tremendous change the library has undergone over the past two years. “Lots of libraries are there for the community, but here in Bayfield, the community built the library,” says library director Amy Dodson. Dodson attributes much of the change and its success to the community’s support via funding and volunteer time. From the total annual budget of $582,000, or $66.52 per capita, $47,408 goes towards materials, and the rest keeps PRL open seven days (62 hours) and pays for a full-time staff of 8.5, of whom 17 percent are professional librarians. These figures would not be possible without the community’s support. In 2013, PRL’s physical space was expanded and designed to be flexible and responsive to the community. New space includes a larger room for community meetings; a new teen zone to host after-school activities, additional Wi-Fi access; and a “garage” door with the ability to open to accommodate program overflow. Additionally, the library expanded its services outdoors in its “Living Library,” a 17,000 square foot area that includes a 24-bed community garden, fruit orchard, 26-foot geodesic greenhouse, and new programming on topics such as food preparation and canning and preserving. This initiative illustrates that PRL is a library built “by the people” as dozens of volunteers donated hundreds of hours to complete the garden beds, toolshed, and greenhouse. In recent years the library has undergone a technological transformation. In 2007, the library launched a technology-lending program so patrons could experiment with devices. The program launched with two laptops and has grown to 50 gadgets on loan, with annual circulation of more than 1,000. PRL’s new story time room includes an interactive SMART Board to use with digital story time and its community room has two interactive white boards for use during public computer classes. Technology training is another big community initiative. In 2013 new class offerings included Microsoft Word and Excel, WordPress, SEO, and digital photography. Partnerships are critical at PRL for educational and program offerings and outreach. The library works with the Bayfield School District on a program that makes the most of late-start days in the school while teachers receive in-service training. PRL’s role includes hosting story time activities at the middle and elementary schools while teachers are in training. The program allows library staff to reach out to underserved populations and has been beneficial to both the library and the school district.Additional partnerships include a free babysitting training course for local teens through the American Red Cross, which includes CPR and first aid certification. Two finalists will also receive prizes. LJ proudly named Bertha Voyer Memorial Library in Honey Grove, TX, and St. Helena Public Library in CA as the finalists for the 2014 Best Small Library in America. Both libraries feature the programs, tech savvy, and commitment to the community that signify the Best Small Library in America. 2014 Public Library Association conference in Indianapolis, IN and recognition at an award celebration. See more information about the winner and finalists in the cover story in the February 15, 2014 issue of Library Journal and online http://lj.libraryjournal.com/2014/01/awards/best-small-library-in-america-2014-pine-river-library-co. I would like to know if there are any classes for the green house or gardening classes given at the library. If you do not have any classes do you know of any in the area. Hi Peggy! Growing Spaces doesn’t have any classes scheduled at the library at this time. We do have some online courses available for purchase. Is there anything specific you would like to learn?